Transient expression in mammalian cells is especially crucial when post-translational modifications and appropriate protein folding is desired for downstream applications. Combining our rich experience in both molecular biology and cell system engineering, GenScript has established as a world-leading expert in transient expression systems. We use the proprietary transient mammalian expression technology to modify cellular pathways to achieve optimal protein and antibody yields (up to 3 g/L). 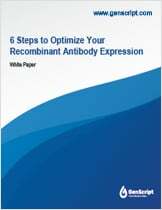 We also optimized expression protocol and growth media to maximize the cells longevity, for guaranteed gram-level recombinant protein expression projects. For rAb production of samples 4 and up, up to mg.
For transient expression of secreted proteins and extracellular domains of membrane proteins. For transient expression of secreted proteins. 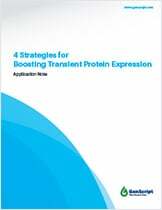 For all other protein and rAb target types we offer fully customizable transient expression services in consultation with clients. Write to us to discuss project details. *QC data: SDS-PAGE and/or HPLC will be performed to determine protein and rAb purity. BCA or Bradford assay will be used to measure protein concentration and A280 will be used to measure rAb concentration. LC-MS/MS peptide mapping will be used to determine protein identity if necessary. GenScript uses The Endosafe®-PTS™ endotoxin testing system from Charles River Laboratories, for rapid endotoxin detection. "Guarantee" indicates that deliverables will meet or exceed requirements listed for the respective service. If deliverables do not meet guarantee, there is no charge to customer. We use Chinese Hamster Ovary (CHO) and Human Embryonic Kidney 293 (HEK) as our primary cell lines for transient expression owing to the ease of handling, robust growth rates, excellent transfectability and high yield recombinant protein-generation capacity.